An intimate culinary portrait of Los Angeles today—a city now recognized among food lovers for its booming, vibrant, international restaurant landscape—with 100 recipes from its restaurants, juice bars, coffee shops, cocktail lounges, food trucks, and hole-in-the-wall gems. Once considered a culinary wasteland, Los Angeles is now one of the most exciting food cities in the world. Like the multi-faceted, sprawling city itself, the food of Los Angeles is utterly its own, an amalgam of international influence, disposable income, glamour, competition, immigrant vitality, health consciousness, purity, and beach-loving, laid back, hip, unrestrained creativity. With 100 recipes pulled from the city's best restaurants but retooled for the home cook—like Charred Cucumber Gazpacho, Roast Chicken with Spicy Harissa, Vietnamese Coffee Pudding, Blackberry Mint Mojito Ice Cream and Thai Basil Margaritas—EAT. COOK. L.A.; Notes and Recipes from the City of Angels is both a culinary roadmap and a sophisticated insider's look at one of America’s most iconic and fascinating cities. Aleksandra Crapanzano is a screenwriter and food writer. A recipient of The M.F.K. Fisher Award for Distinguished Writing from The James Beard Foundation, she has been widely published in The New York Times Magazine, Food & Wine, Saveur, Travel & Leisure, Gourmet, Elle, Departures and The Wall Street Journal, where for the last 8 years she’s served as a food columnist. Her essays have been anthologized, most notably in Best American Food Writing, and she is the author of The London Cookbook: Recipes from the Restaurants, Cafés and Hole-in-the-Wall Gems of a Modern City. Aleksandra considers Los Angeles to be like a second home—it’s where she first fell in love with film and the West Coast, as a teenager interning on the set of a television series. Later, she would go on to write screenplays for many Hollywood studios. Nowadays, if she’s not eating her way through the city, she’s visiting some of her closest friends and in-laws in the City of Angels. She currently resides in Brooklyn with her husband, the novelist John Burnham Schwartz, and their son. 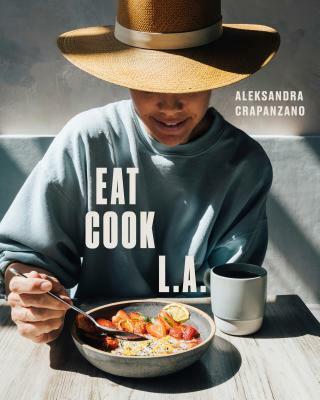 "Aleksandra Crapanzano has written a bright, informative, elegantly composed insider’s guide to the great L.A. restaurant revolution, which even a grumpy New Yorker can love." "When I say this cookbook does justice to one of the world's most delicious cities, that's no small feat. Aleksandra Crapanzano deftly captures the pulse and vitality of London's new food landscape while honoring its culinary architects." "I can't imagine anyone as perfect as Aleksandra for the task of capturing the amazing spirit (and surprises) of the new gastronomic London. A celebrated food writer in the U.S., she also happens to know our city like the back of her hand, writes beautifully, and has the wit and imagination needed to uncover the city's best kept culinary secrets, its variety, and its flavors."